Forex trading has gained a great deal of popularity of late due primarily to its flexibility and the size and nature of its market. The Currency market is the largest market in the world. At $4 trillion of volume on every business day, it ranks well above any other market on the planet, and its shear size alone prevents anyone, even a nation's central bank, from ever manipulating the market to their advantage. In order to trade Forex, an access device and the Internet is all that is required, and as for location or time of day, both factors tend to be irrelevant. You can trade after work in your nearest Starbuck's or in your bedroom for that matter. Beginners are always cautioned that high risks prevail in this arena. Specialized training and, hopefully, a mentor to guide your efforts are seen as "essential" if you are to have any chance at succeeding here. However, as with any investment activity, the same three factors are required for trading success: knowledge, experience, and emotional control. These tenets are often shouted from the rooftops and repeated "ad nauseum", but for some reason, many newcomers are either too impatient or inexperienced to hear these words of wisdom. As a result, there is a high casualty rate amongst beginners. Forex trading is not gambling but you must approach it like a business, with discipline and finesse. The Forex market is huge, but over 50% is between large global banks, the "Interbank" market as it is called. There are no centralized markets, although some exist for futures contracts and options. 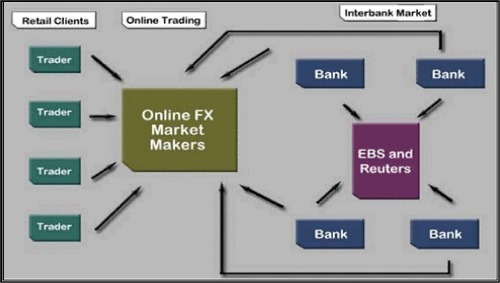 Sophisticated networks provided and maintained by Reuters and EBS connect major trading partners electronically. There are many forex markets around the world, but the major ones are in London, New York, and Tokyo. Each day the cycle begins in New Zealand and Australia, then Tokyo, and then follows the Sun around the globe until New York where it closes, only to begin the cycle once more on the following business day. U.S. Congress created the Commodity Futures Trading Commission in 1974. The CFTC is an independent agency of the U.S. government, charged with regulating commodity, currency, derivatives, and financial futures and options. The agency has done much to police fraud in the industry and to protect consumers from unscrupulous brokers. It is easy now to review reliable forex broker ratings on the Internet and to choose your "unseen" but very important business partner after a bit of due diligence. Many of the principles learned in day trading stocks easily transfer to forex trading. However, the issue of "intrinsic" value is nonexistent. Currencies come in pairs. Their values are “relative” to a comparison of each country’s economic health. Part 2 - Forex Trading In the second part of this 3-part series, we will discuss how these values are determined on each and every trading day.